Otemachi (大手町) is the economic center of Japan located near Tokyo Station. Most of major Japanese Banks, Trading Companies, News Papers and Mass Media are based on Otemachi. Some of the government offices are also here. 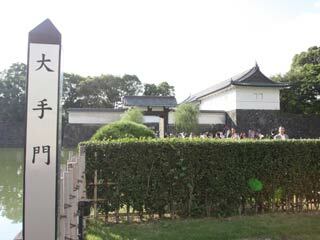 Otemon, which is the main entrance of the Imperial palace East Garden is located in Otemachi. There are lots of restaurants underground levels. Most of the Tokyo Subway travel to Otemachi. Marunouchi Line, Tozai Line, Chiyoda Line, Hanzomon Line and Mita Line come to Otemachi. There is nobody lives in Otemachi, but daytime population is over 72,000 people. The Masakado-zuka, the grave, enshrines the decapitated head of Taira no Masakado (903 to 940 BCE), Heishi clan, a descendant of Emperor Kanmu and a well-known hero of the eastern region of Japan. A precursor of the samurai warriors, Taira no Masakado carried out political reforms in the Kanto region and became immensely popular among the common people for helping the weak and poor and fighting against oppressors. His courage and audacity were, in a sense, mirrored in the samurai sprits as well as the ethos of Edokko. In 940, Tairano Masakado was defeated and kill in the Tengyo-no-ran (his struggle with the government), and his decapitated head was put on display in Kyoto. Legend has it that his head flew all the way back to Kanto region as a vengeful sprits and finally landed at Otemachi. People believed that such vengeful sprits, which were thought to cause plagues, could be appeased by worshipping them as guardian deities. Thus it was that in 1309 Taira no Masakado was enshrined as one of deities of Kanda Shrine, which was originally located at that spots. Every autumnal equinox the grave ceremony is held. Also, every May hundreds of Mikoshi including Masakado Mikoshi are travel at the gravel in Kanda Festival. At other times of the year, the Masakado Mikoshi rests peacefully in a storehouse at Kanda Shrine.